The rate of people who consult doctors to cure back pain is rapidly increasing today. Human body lower back consists of vertebrae of spine, ligaments, and muscles. In addition to these, there are intervertebral discs in our spine, which is like a cushion made up of cartilage that is fixed in between the two vertebrae. Lower back pain is caused as a result of any injury or disease of these discs in our lower back, muscles or those ligaments. 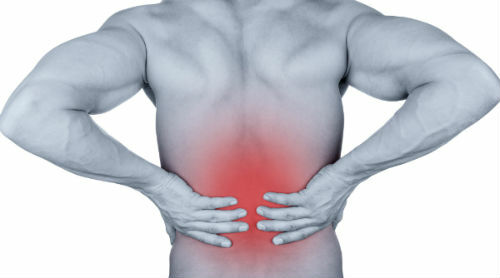 Hereditary, obesity, poor posture or weak back or weak abdominal muscles can also cause back pain. When you take hereditary out from the picture, the rest of the above reasons may occur because of poor diet and lack of exercise and that eventually guide to back pain. The best solution in this scenario is treated your body in a natural way. Give enough exercise to your body and especially to the back muscles to bring back your body to function in a normal way. Yoga is the best remedy in these situations. There are certain yoga poses that will strengthen our back. They not only relieve pain but also prevent back pain in the future. Lower back stretches are very useful to get rid of back pain. It is very important to practice to keep smiling while you do yoga. This will let you to make your mind happy and generate the enzymes that help you to feel calm and relaxed. Sit crossed legged with your back straight and shoulders relaxed. Breathe in deeply. While breathing in, raise your arms from both the sides. Interlink your fingers together with your thumbs touching each other. Bring your arms from the front to the top of your head. Stretch your arms as much as you can, but do not strain your muscles. Bring your elbows straight and your biceps touch your ears. Be in this position for 20 seconds. Take deep breaths. This yoga can be done in standing position also, but please be careful to keep your legs parallel to each other while doing in standing position. This should be done after the spine lengthening yoga. Begin this with the spine lengthening yoga pose. That is, with your interlinked fingers, stretch your arms straight on the top of your head. Breathe out slowly. Twist your body to the right side slowly; here it will give pressure to your hips. Hold on to this position for up to 4 or 5 breaths. Inhale and come back to the center position. Again exhale, and twist your body to the left side and hold on to this position for up to 4 or 5 breaths. Inhale and return to the center position. This yoga will help you to experience a deeper stretch on your back. It will make your back more flexible and strengthen back muscles. Begin these exercises with your fingers interlinked above your head. Breathe out and stretch your hands to the front. Exhale and turn your hands along with your body to your right. It is important to keep your hands parallel to each other and they are stretched equally while you turn your body. Inhale and come back to your center position. Unlock your fingers and relax. Place your arms on the ground and push your chest up. This yoga will improve the health of your spine and let your posture straight. Sit crossed legged. Then keep your left leg on your right knee. Inhale deeply and twist your body to the right. Keep your right hand on the floor near the right hip. Stretch upward by pressing your hand against the floor. Remember to keep your back straight. Inhale and come back to the center position. Do the same twisting to either side. This exercise will strengthen your back muscles. It is better to tuck in your tummy to experience a deep stretch. Stand straight. Keep your feet hip-width apart. Bend forward over your legs with your knees slightly bent. Bend as much as you can until your tummy touches your thigh. Hold your hands into fists and place them on the opposite creases of the elbow. Inhale and exhale deeply in this position. This exercise will release more tension from the back and also help to melt the excess fat from your belly. Lie down on the floor facing the ground. Place your hands in front of you. Flatten your palms on the floor. Lift up your hips from the ground and balance yourself on your feet and hands. You will now feel a stretch on your back and hands. Hold on to this position and take deep inhale and exhale. This will strengthen your back and keep it under control. Sit down on your heels. Bend forward and place your head on the floor. Keep your hands behind your back. Inhale slowly, pull your abdominal muscles towards your spine. Inhale and slowly exhale. Then relax. Read This Tips Before Practice! Do not sit in the wrong position and strain your lower back. After working a long time in the same posture, remember to walk a little and give simple stretch relaxes to your back. Breathe slowly throughout during your workouts. Keep smiling throughout your workouts and keep yourself calm and relaxed. Practicing yoga regularly will prevent any back problems in the future. It will prevent all kind of spinal disorders. It will help to improve body posture and strengthen the abdominal and back muscles. It also relieves the back from stiffness and tension. Therefore it is recommended to practice yoga at least ten minutes daily.